The Advance Health Care Directive communicates your health care wishes and appoints your agent to carry out your wishes upon your inability to communicate with a treating physician. This document sets forth your decisions about artificial life support, types of treatment you may or may not want, and other personal health care matters, well in advance of those questions ever arising. Not only does it ensure that your wishes will be heard, but prevents your loved ones from having to guess about what you would have wanted. In doing so, it prevents potential conflict within the family in a time of crisis. 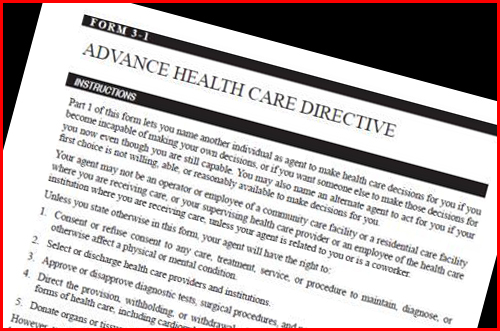 Any well planned estate will include an Advance Health Care Directive. This document is also known as a Power of Attorney for Health Care.